Some more sketches of some household ‘things’. We have my window in our front window, and an imaginary fireplace (something close to what I would love when we move). 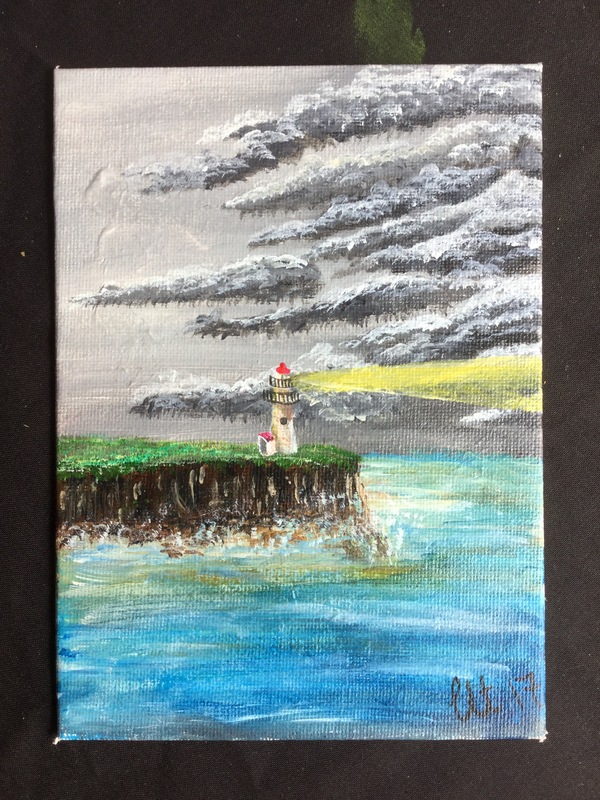 The lighthouse is something that I’ve painted before (below) but I wanted it to be a little different. So I’ve done it in watercolour pencil and put a black ball point pen design in the shape of a heart around it. I love harsh lines against something as soft as watercolour. Train (the band) is what I’m listening to right now and there are a few songs that really get me. Brick by Brick, Marry Me, and Words. They just speak to my present mood and I love singing at the of my lungs in the car when no one can hear! Check this painting out and many more in my etsy shop! https://www.etsy.com/uk/shop/ChrissyTurleyArtist and follow me on instagram at www.instagram.com/chrissyturley30. My new jar took about 5 hours to stick on all those beads and the string. It was totally worth it, my brushes have the perfect pretty home! P.S I love a good storm! The colour of the sky, the clouds and the sun being chased back.